Infos techniques The "Schleicher-Poppenhausen" Aircraft Works likewise brought to the Rhön meeting 1929 a two-seater built from a design of the author's, which in its general build approached more nearly the form of a high-performance glider. This aircraft "Rhonadler" (Fig. 19) has an understrutted wing, built in two sections, with a straight middle portion and tapering trapeziform outer portions. 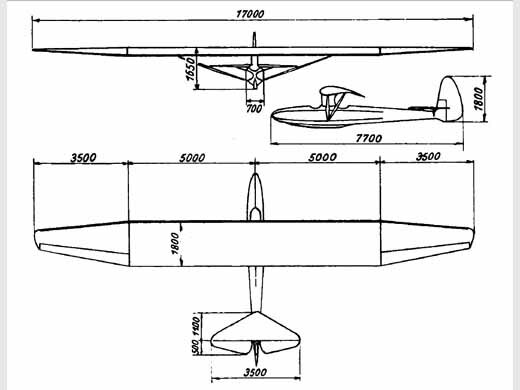 The wing-section of the innner portion is the R.R.G. No. 652, which was also employed for the Munich Machine "Kakadu." In the outer wing portions this wing-section is gradually and evenly reduced to a thin slightly-cambered wing-section, in order to increase stability and and controllability. By the internal construction of the wing a further attempt was made to develop the method of construction with a supporting outer skin, such as had already been put into practice in a different way by the Munich group. possible by the fact that these members are glued direcily to the plywood wall of the spar. not satisfactory, a fact which was established during a cloud flight up to a height of 1275 metres with the machine flown as a two-seater and piloted by the glider-pilot Groenhoff. By this record altitude flight for two-setters Groenrioff at the same time exceeded the distance record for two-seaters with a flight of 33 kilometres. The high-performance glider of Schleicher from the previous year was likewise flown by Groenhoff. Only the machine's rudder was somewhat altered. 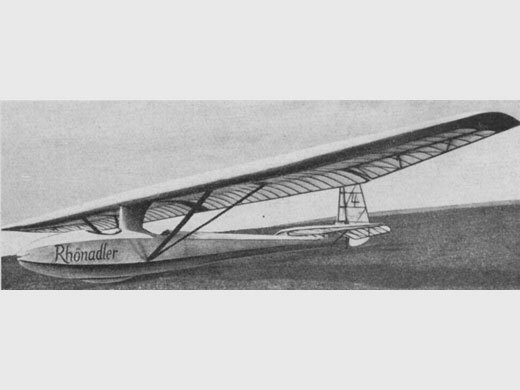 In the early days of the meeting Groenhoff carried out various successful flights with it. During a sharp turn above the wooded south-easterly slope of the Eubeberg the machine side-slipped down on to its wing and crashed. Histoire résumée Avec le biplace Rhönadler, Günter Groenhoff, et Leo Bub (de Poppenhausen), établirent deux records le 30 juillet 1930 : gain d'altitude de 1250 mètres et distance de 36 km (à la Wasserkuppe ?). par LANGSDORFF, Werner von (1931) [p. 59, 69, 71, 165. Notes + photo + specs]. par SELINGER, Peter F. (2003) [p. 16, 18, 76. Mention + photo].